As I was getting ready for skiing yesterday morning with The Boss mix pouring out of the living room speakers and today's featured photo to gaze at out my front window, I considered how it is now more than O.K. for me to admit to being a huge Springsteen fan. That train of thought led to how cool Bruce Springsteen remains, and how, even at the age of 59 and loaded, he embodies a compassionate and hopeful outlook on life. I finally feel like my Pollyanna attitude has a basis in reality. Amazingly, in our brave new world, it is not odd to be an optimist. It is actually a plus to admit you worked hard in school and were not content with a "C." It is such a relief that honest hard work, excellence and achievement are honored and those who excelled are no longer considered just dorky geeks. Maybe the "money for nothing" days are over?! Clearly, we need all the hope, hard work, good examples and compassionate inspiration we can get. 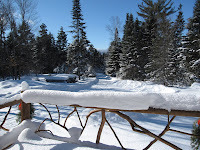 How does all this relate to the Adirondack Lifestyle I purport to write about? I'm not sure, but this is my blog and I get to spout off whenever I like. O.K.....here's a thread back to the Adirondacks: Bruce Springsteen thinks these Adirondack Mountains are beautiful too. He told me so himself one day at the gym. True to form, yesterday was an indeed incredible day in the Adirondacks. The cross-country skiing at Mount Van Hoevenberg was simply excellent. The trail groomers deserve a tip of the tuque for the beautifully set tracks; it was a tuck and go day on every downhill in the place. By the way, my Boss song mix is an awesome accompaniment to a long cross-country ski; "It's gonna be a long way home...." And yes, I will be watching the Super Bowl this year. I need a dose of hope.